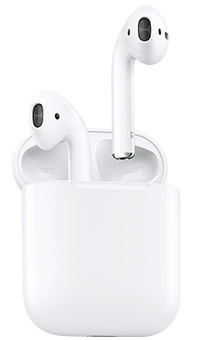 Introducing wireless AirPods. Just take them out and they're ready to use with your iPhone, Apple Watch, iPad or Mac. Put them in your ears and they connect instantly. Speak into them and your voice sounds clear. Simplicity and technology, together like never before. Simply double-tap to activate Siri, then adjust the volume, change the song, make a call or even get directions. And whether you're talking to Siri or making a call, clever beamforming microphones filter out background noise and focus on your voice. AirPods deliver an industry-leading 5 hours of listening time on a single charge. The charging case holds multiple additional charges, providing over 24 hours of listening time. And just 15 minutes in the case gives you 3 hours' listening.